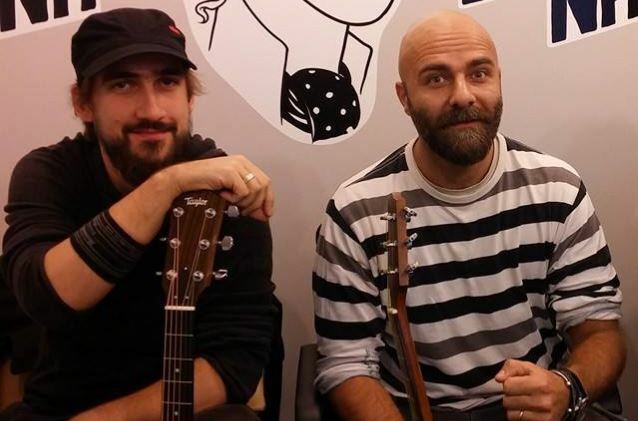 According to Ziarul De Iasi, GOODBYE TO GRAVITY guitarists Vlad Telea and Mihai Alexandru (pictured) were among the 27 people who were killed by a fire in Bucharest nightclub last night (Friday, October 30). Lead singer Andrei Galut is in serious condition at Elias hospital with burns on 45 percent of his body and injuries from smoke inhalation. Bassist Alex Pascu is said to be at Spitalul de Urgenţă Floreasca (Bucharest Emergency Hospital), where he underwent surgery. The fire reportedly started after GOODBYE TO GRAVITY's pyrotechnical show went awry, causing the ceiling and a pillar to catch alight and producing heavy smoke (see photos below). Media reported that clubgoers initially thought the flames were part of the show and did not immediately react. One concertgoer, a Spanish teacher named Delia Tugui, described the incident on her Facebook page. "The lead singer made a quick joke: 'This wasn't part of the program,'" she wrote. "The next second, he realized it wasn't a joke and asked for a fire extinguisher. In 30 seconds… the fire spread all over the ceiling. People rushed to the entrance but it was too narrow, and people panicked. Behind me people stampeded, climbing over each other, to try and get out." The concert was supposed to be a record-release party for GOODBYE TO GRAVITY's new album, "Mantras Of War". "I am saddened, but also revolted that a tragedy of this scale could have taken place in Bucharest," Romanian president Klaus Iohannis said. "We already have indications that the legal regulations had not been respected," he said. "I hope that the authorities manage their inquiry with speed and rigor." Local journalist Sorin Bogdan told the BBC that the Colectiv nightclub, housed in a former factory, had two small exit doors, only one of which was possible to open initially. A witness quoted by Romania's state news agency said clubgoers had to break the second door down to escape. 23 of the 27 people who died have been identified so far, according to ZF.ro. Many of the victims did not have identification on them. Three days of national mourning have been declared in Romania following the tragedy. An investigation into the cause of the incident is already underway. The Station nightclub fire in that killed 100 people in West Warwick, Rhode Island, in 2003 during a GREAT WHITE concert was also blamed on pyrotechnics igniting foam used for soundproofing. GOODBYE TO GRAVITY started as an unexpected mixture of former members from the heavy metal band THUNDERSTORM (which in their 10-plus years of activity opened for such heavyweights such as JUDAS PRIEST, MANOWAR, HELLOWEEN, RAGE and EVERGREY) and the winner of the 2008 national TV show "Megastar" (Romanian "American Idol" equivalent).